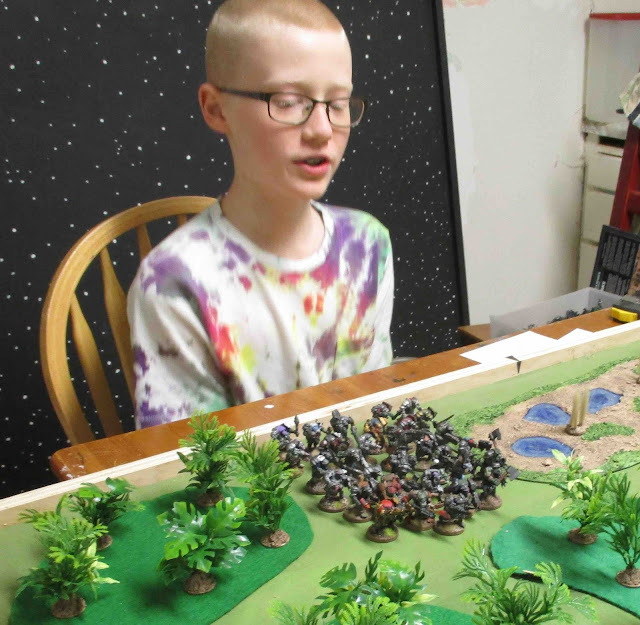 Friday I tried to set up a quick game of 40K 8th Edition for the kids to play. Okay so none of us are playing chaos... but Dark Millennium...? Eternal War...? Eye of Terror...? That's all 40K themed, right? 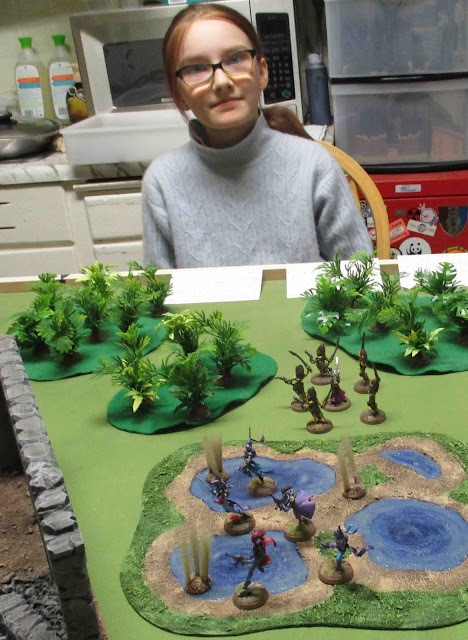 Then I set up some jungly terrain for them to play on (actually, I set up the terrain first, and initially I set it up thinking my jungle-fighting' Guaiacan Commandoes would be facing off against Finnegan's Ork Horde... but then I decided maybe it would be better if the two kids played their own forces against each other and I just played the Games Master...). Both rolled out with forces at Power Level 17. 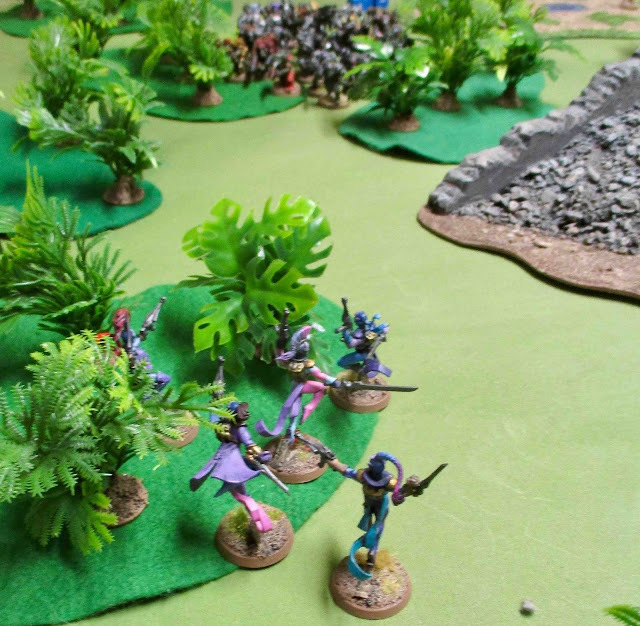 I knew from the get-go that they would be horribly mis-matched (and warned The Girl that her pretty Eldar would likely be slaughtered...). We decided to quickly play one of the narrative scenarios out of the book. I'd suggested Patrol or Ambush. I tried to convince them to try ambush with the Orks ambushing the Eldar, which I thought might actually give the Eldar a chance, but for some reason they went with the Patrol. 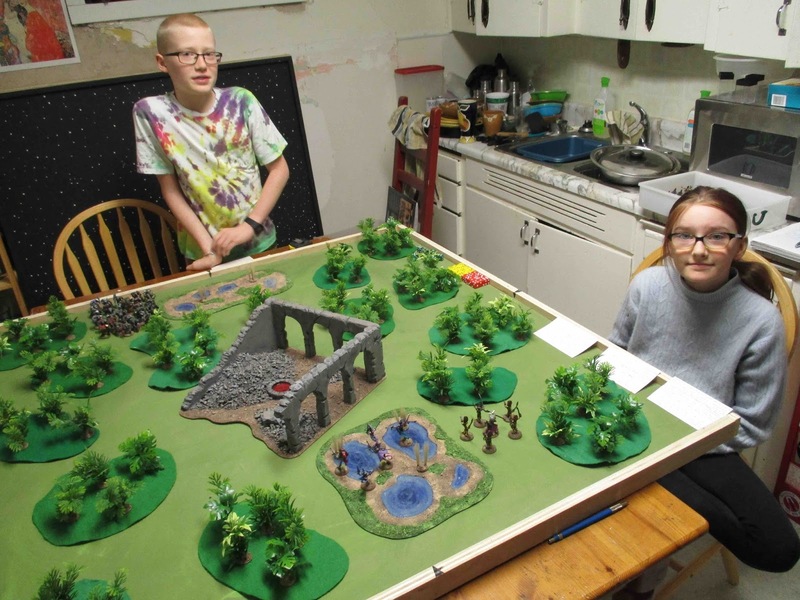 The patrol scenario is essentially a meeting engagement between two patrols which, if playing with larger forces, escalates into a larger engagement as reinforcements arrive. Both sides are to start with only three units on the table and the rest in reserve. As these guys only HAD three (or less) units, it basically just became a rather boring meeting engagement with no objective other than to kill the other guys... yawn-o... ah, well... we're just trying things out and learning the rules, right? Anyway, sides were chosen, units were set up and The Girl took the first move. 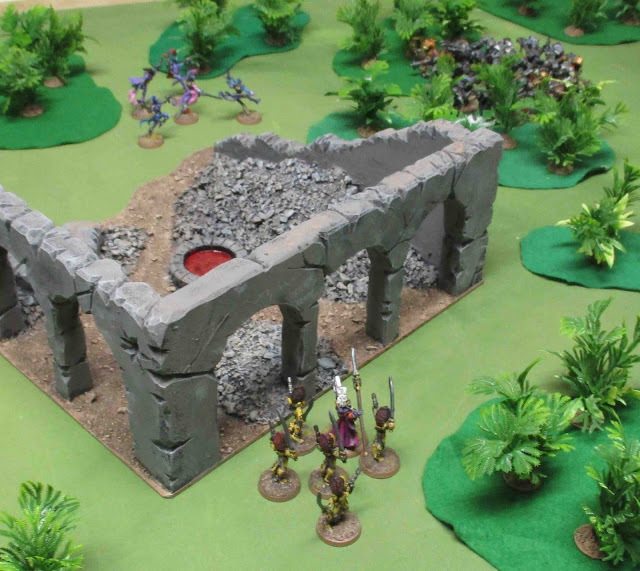 The Howling Banshees and the Farseer flanked around one side of the ancient ruin in the middle of the battleground. 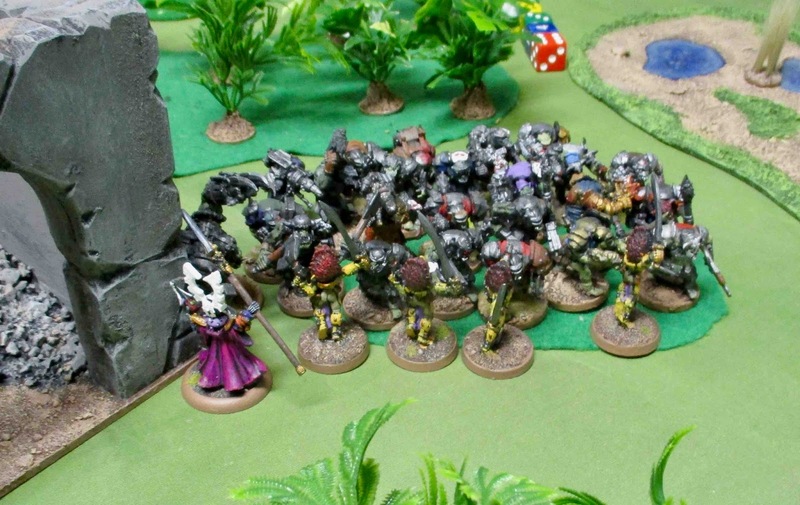 The Harlequins, always wanting to do their own thing, flanked around the other side - directly towards the massive mob of Orks. "Jazzy" led the harlequins out of cover in front of the Ork mob in preparation to shoot at them and charge them later in the turn. 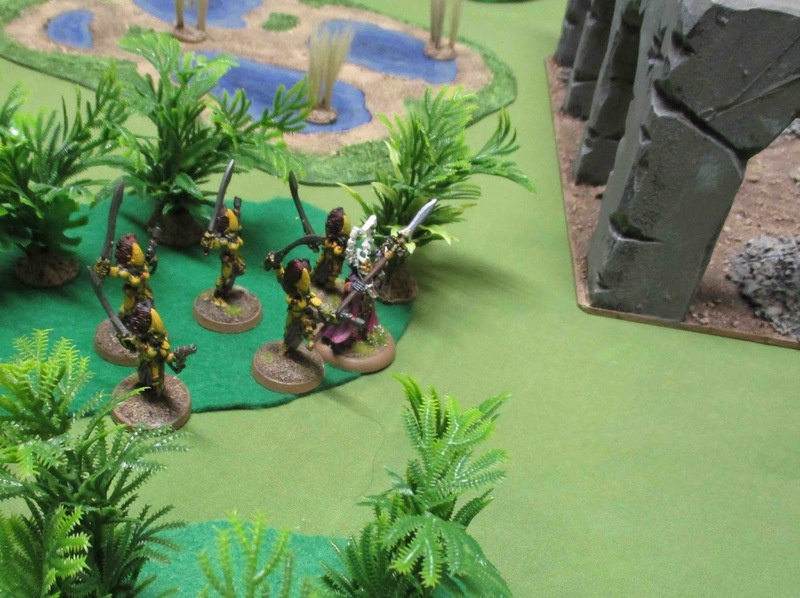 J'Ade the Farseer couldn't see far enough to smite the Orks, but successfully manifested a Guide power allowing the harlequins to re-roll ranged attacks for the turn. The Harlequins then shot up the Ork mob, downing three of them. 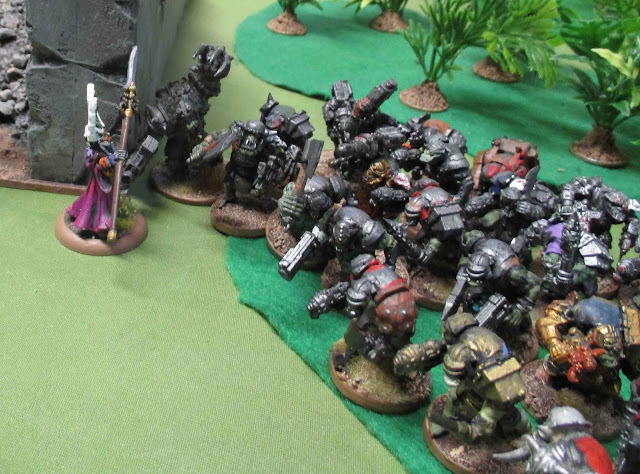 In the Charge Phase they indicated their desire to charge the Orks. The Ork overwatch fire took down two of them. 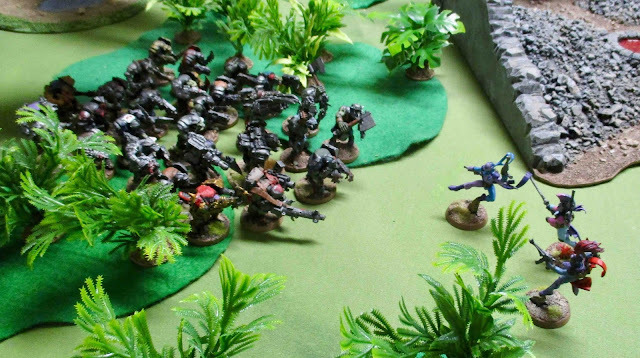 All this really did was get their attention and they surged through the jungle towards the Eldar. They unleashed some more dakka at the elder and took down one of the Howling Banshees. Ork Hordes are nasty... I'm not really sure how she could have dealt with them. 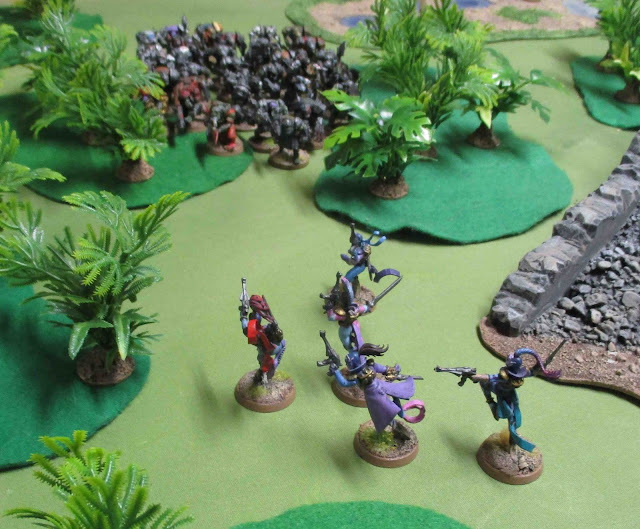 the Harlequins and howling Banshees would have been nasty in close combat - if they'd ever been able to GET into close combat and have a chance to HIT the orgs, but even so, I'm not sure they could possibly have killed enough of them fast enough... 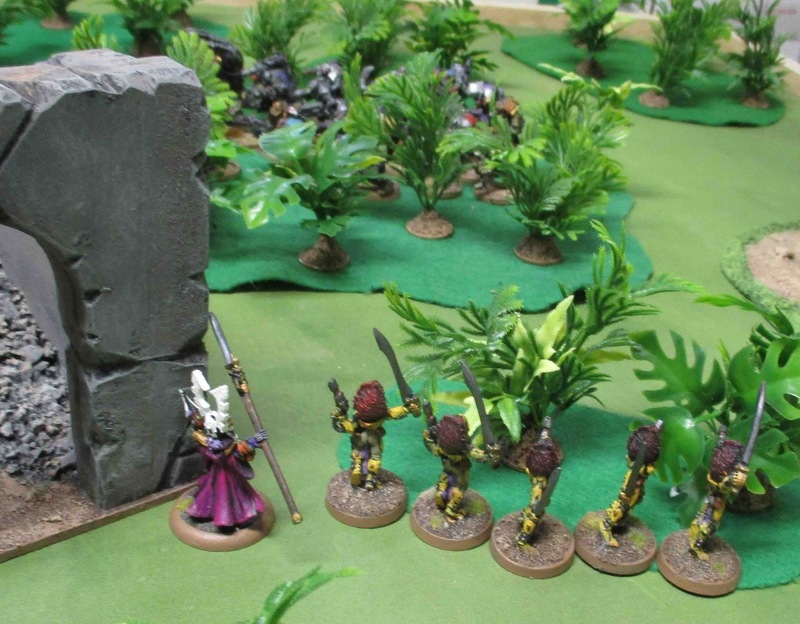 I guess The Girl just needs to get some more long-range-shooty Eldar painted to beat them up a bit first and THEN charge in with the Harlequins and Banshees to finish them off...? I was worried the game might have discouraged her, but it kind of did the opposite - she's now determined to get back to painting her Eldar and do exactly as I had figured - paint some of the long-range-shooty units! Although the only thing I think she owns that comes close is guardians (whose shrunken catapults aren't all THAT long ranged!? 12"!? that's the same as PISTOLS!?) but they do have a couple of heavy weapon platforms...? This went better for the Orks than our last couple attempts (with 7th edition). Although Finnegan felt a little bad about utterly destroying his sisters forces and was worried they might be a little TOO good... I'm sure once we play a few other scenarios which don't just involved trying to overrun and kill everything he may find they're a bit of a one-trick-pony... thought for now it does seem like one REALLY GOOD trick! 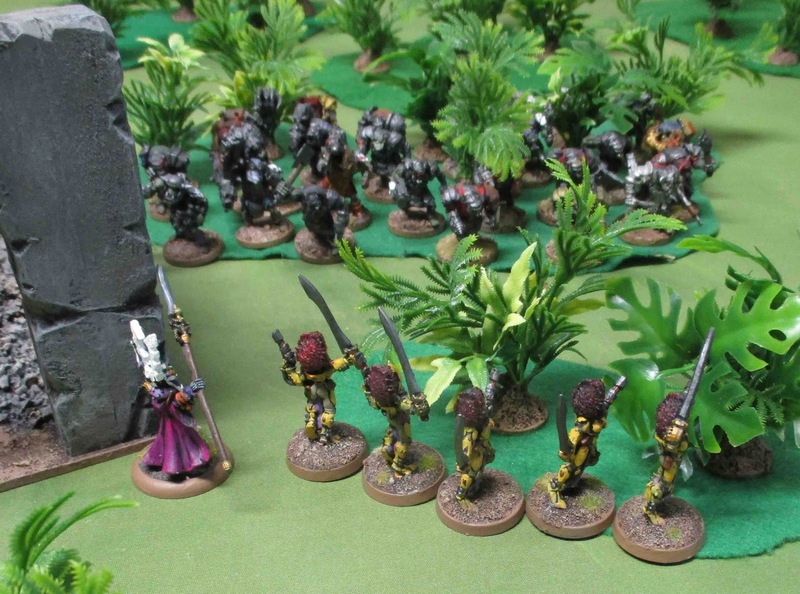 I am interested to get my own Guard on the table - perhaps in slightly larger formations and see how they fare against the Green Tide! But for now I probably need to get back to work on my Jet Bikes and other stuff I need to prepare for the games I am running at ToonCon just ONE WEEK FROM TODAY!! I had to toss in some Bolt thrower also while I read this. Great to see that your daughter was not discouraged with the loss. Sounds like they had fun at least, on with the jet bikes! On with jet bikes! Thanks! Bolt Thrower rools. Horns up! I have to admit the Bolt Thrower cd was a relatively recent purchase. I remember the being advertised back in White Dwarf magazines many, many years ago, but their CDs/Tapes/Records simply weren't available in Saskatoon, Saskatchewan, Canada at the time. 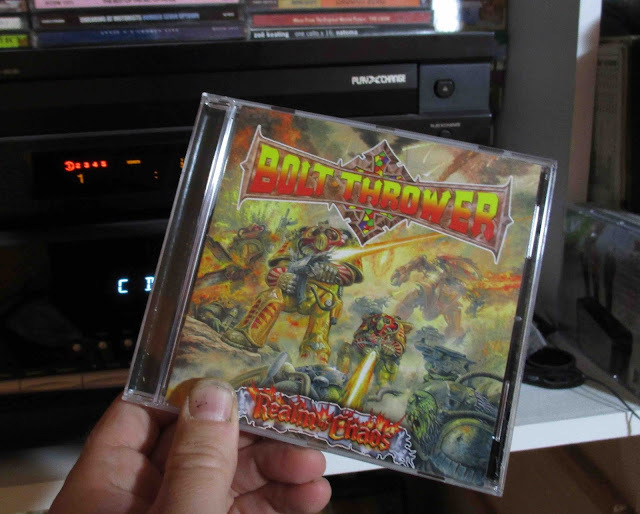 Flash forward a decade and a half - I was working part time in a record store and we actually got in a used copy of a Bolt Thrower CD! I was so excited! Even though I hadn't played any GW games in years, I'd always wanted to hear Bolt Thrower. So I threw it in the CD player and listened to it a bit and... well... I'm not a HUGE fan of metal... and was a little underwhelmed and ended up not buying it for some reason. by the time I got home I was regretting not having done some, so the next time I was at the store I looked for it and it was gone. Flash forward another decade and a half and if found myself picking up 40K 8th edition and for some reason thought of Bolt Thrower and wondering if they're still around and if their CDs were still available, and sure enough I found this one on Amazon (available through a marketplace seller) - brand new - for just under $10 including shipping. So I totally ordered it and it just happened to arrive this last week! Still not a super huge fan of metal, but fun for a soundtrack for games in the grim dark future of 40K. Sounds like the girl needs something rapid fire to clear out all those orcs (or something that used to be template based, and thus now rolls d6 hits) Scatter lasers? Shadow Weaver? She needs something high-volume-shooty for sure. Dark Reapers? Next time she can fight my Guard and kick their asses.